Denver — Global engineering and consulting firm CH2M has been ranked #22 on Fortune Magazine’s Change the World list. The 2017 list highlights 50 leading companies that are innovating to solve the world’s biggest challenges through core profit-making strategy and operations. Companies were ranked based on the three criteria of measurable social impact, business results and degree of innovation. Measurable contributions to societal impact — CH2M tackles complex engineering projects with a sharp focus on delivering triple bottom line benefits. 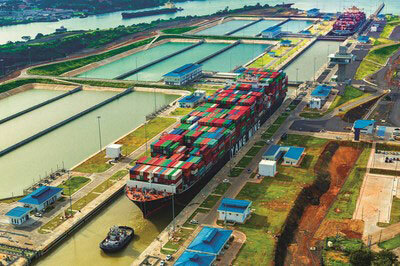 When the Panama Canal Authority chose CH2M to help manage the iconic canal’s $5.25 billion expansion, the company also addressed the social opportunity, helping to develop Panamanian workers with job-related skills that would serve them during and after the project. From an environmental standpoint, the design and construction of new locks feature water-saving basins that recycle up to 60 percent of the water used per transit. Since the June 2016 completion, the canal can now handle larger supertankers and twice the overall tonnage with the additional channel, increasing economic benefits of greater cargo tonnage for trade among 160 countries. Commitment to community investment programs — With a fundamental purpose to advance human progress, CH2M achieves this aim in its client work and via corporate citizenship and philanthropy. CH2M and its foundation support nonprofit partners globally with corporate and employee giving and volunteerism improving the lives of thousands of people, including Bridges to Prosperity; Engineers without Borders; and Water For People. The foundation contributes to nonprofit organizations around the world with a focus on developing sustainable communities and promoting STEM education. Since 1991, CH2M has partnered with Water For People, an international nonprofit working across nine countries to bring safe water and sanitation to 4 million people. CH2M employees and its foundation have donated over $3 million to Water For People over the past several years, including a record-setting $232,000 from employees alone in 2017. In response to the widespread devastation caused by Hurricane Harvey, the CH2M Foundation immediately offered an employee matching gift incentive and built an online giving site with strategic partner American Red Cross. Combined with proceeds from a foundation golf tournament, the company’s charitable impact to help those affected by the disaster has surpassed $125,000 and continues to rise as employee contributions grow. Innovative strategies that positively affect the world — Innovation is core to CH2M’s work, from self-sustaining infrastructure powered by renewable and reclaimed resources, to cities developed on the leading digital edge. Among the most important ways CH2M innovates is addressing global water challenges, with integrated management and proprietary water renewal and energy recovery technologies ensuring resiliency throughout the water cycle. CH2M received the prestigious Stockholm Industry Water award in 2015 for 50 years of advancing technologies for potable water reuse. In 2016, CH2M received the World Environment Center Gold Medal Award for International Corporate Achievement in Sustainable Development, recognizing the company’s deep commitment to sustainability, social responsibility and industry innovation throughout the company. CH2M partners with skilled visionaries like The Nature Conservancy to change the way the industry approaches infrastructure solutions and engineering practice.